Time travel is one of those concepts most often left for fantasy novels, movies, and long conversations about the what-ifs of life. But for many researchers, it’s been a plausible reality for decades. In 2014, a group of scientists from the University of Queensland, Australia, simulated how time-travelling photons might behave. They discovered that, at the quantum level, the grandfather paradox, the phenomenon which makes time travel impossible, can actually be resolved. Their research, titled “Experimental simulation of closed timelike curves,” was published in the latest issue of Nature Communications. In their study, the researchers use photons, or single particles of light, to replicate quantum particles travelling back through time. Upon analyzing the particles’ behaviour, the scientists realized something strange was happening. For the simulation, the scientists studied how the behaviour of a photon travelling through time communicated with its original version. Simulating the behaviour of this second photon, they were able to study the behaviour of the first – and the results show that consistent evolutions can be achieved when preparing the second photon in just the right way. The grandfather paradox says that, should a time traveller go back in time, he would mistakenly prevent his grandparents from meeting, and therefore prevent his own birth. But, if he had never been born, there is no way he could have travelled back in time to begin with. Albert Einstein’s special and general relativity theories have led physicists to believe that time travel could be possible. Special relativity says that space and time are aspects of the same thing, called the space-time continuum. It says that time can speed up or slow down relative to how fast you are moving, relative to something else. 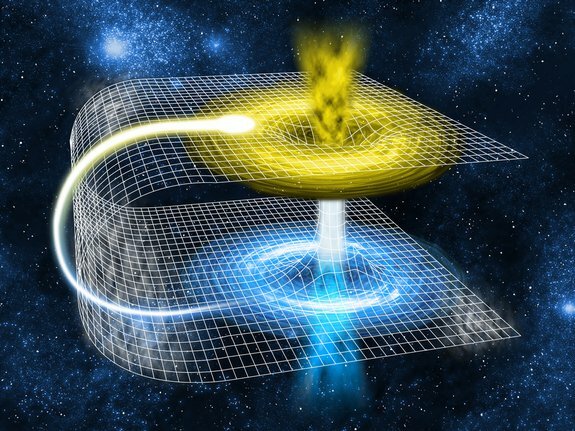 General relativity claims that travelling backwards in time relies on a space-time path, such as a CTC that returns to the starting point in space, but comes at an earlier time. In 1991, it was predicated that quantum mechanics could bypass some of the paradoxes that Einstein’s theory of relativity established, with quantum particles acting nearly outside the domain of physics. In 2012, physicists David Wineland and Serge Haroche shared the Nobel Prize in Physics for demonstrating how “quantum weirdness” could not only exist at the subatomic micro-world level, but also show itself in the macro-world. Not everyone agrees time travel is possible, however. Stephen Hawking, for instance, revealed in a BBC documentary that it simply can’t happen. But regardless of the physical problems and paradoxes, such advances in quantum theories open the doors to a better understanding of potential ways to overcome time travel paradoxes.